One GDG Devfest Philippines. 367 Attendees. 15 Technical Sessions. 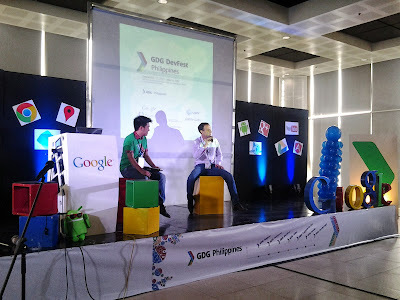 After 3 months of planning, GDG Devfest Philippines 2013 came to a close at around 5:30 PM last September 17, 2013 (Tuesday). People lining up for the free coffee! At exactly 9:00 AM, +GDG Philippines Community Manager +Wayne Manuel opened the activities with a Google Hangout with +Christine Songco Lau. She is the Program Manager for Developer Relations in Southeast Asia and is also responsible for running some of the Devfests in the previous years. After the Hangout, +Chelle Gray welcomed the developers to the first of eight Devfests happening all over the country. She also introduced our keynote speaker for the day, +Ammar Ibrahim who talked about innovation, specifically innovation at Google. This was followed by a Q&A Talk Show style about Technopreneurship with +Ron Hose. Questions from the participants were also entertained and answered by Ron. After this very fun and creative Q&A, +anne olvido shared about her experience during the Google I/O. Just before lunch, the team from SplitmediaLabs, headed by it's CEO +Henrik Levring demonstrated their application that uses YouTube API. The attendees lined up for lunch at the buffet table covered with Google color table cloth. We even had Kitkat for dessert! 1:00PM: Google App Engine by +Edge Dalmacio is happening in The Tents simultaneous with Google Drive Realtime API by +Brian Tan Seng in the Boracay Room while Developing Mobile Apps for the Global Market by +Howard Go in the Balesin Room was a full house. from Orange and Bronze Software Labs, Inc.
1:45PM: Google Maps by +Lorenzo Dee, Angular JS by +Jessie Evangelista, and Go Language by +Jan Michael Ibanez are the second simultaneous sessions. 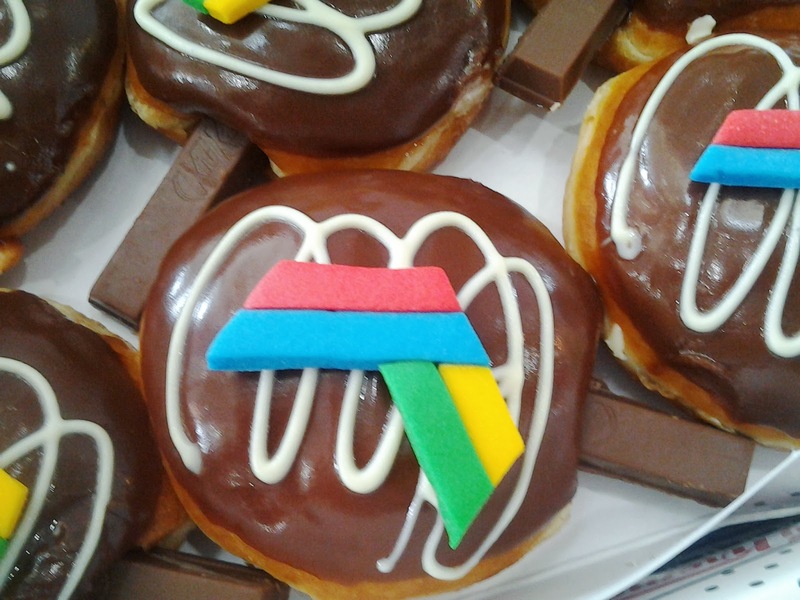 This was followed by a 30-minute break for everyone to enjoy the glazed and Kitkat donuts topped with GDG mint logo. Everyone was also amazed by the huge Android Kitkat cake that was displayed. Huge and heavy Android KitKat cake! 3:00PM: Women Technopreneurship by +Loretta TIOIELA, Google+ Signin by +Bryan Carl Chug, and HTML5/CSS by +Josan Astrid Dometita are the third simultaneous technical sessions. 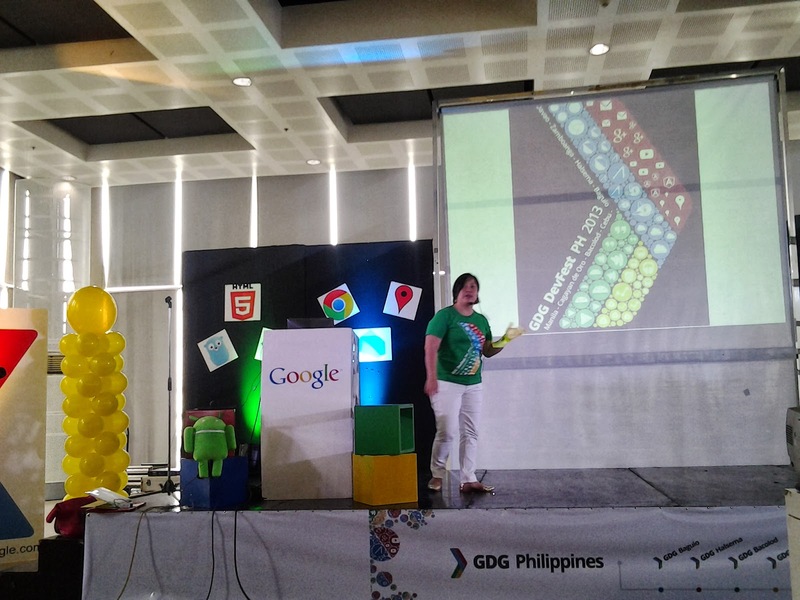 Josan Dometita, GDG Cagayan de Oro Community Manager, shares about HTML5. 3:45PM: The last sessions for the day were Chrome Extensions/Chrome Web Store/Chrome Web Apps by +Carlos Castaño, YouTube API (Dating for YouTubers) by +George Vanous, and Apps Script by +Reymart Canuel. By 4:30 PM, everyone went back to The Tents for the application demo of Project NOAH and Bootleg Radio. Our nationwide sponsor +Globe Labs was also given the time to thank the organizers and participants of the GDG Devfest. Lastly, to close the program we have +Aileen Apolo who got emotional when sharing how the community she started have grown. Before going out of the venue everyone got a free shirt! For more pictures kindly check here and here. GDG Devfest PH 2013 Shirt for everyone! We would like to thank +Google, +Google Developers, +Globe Labs, #Freelancer, and #QSR for making this event a huge success. We also extend our deepest gratitude to all the speakers who shared their time and expertise to all those who attended. To the participants, we hope you were able to learn a thing or two with all the sessions we have prepared for you guys. Lastly, to all the organizers and volunteers, you were amazing! Thank you for making this event organized and possible. 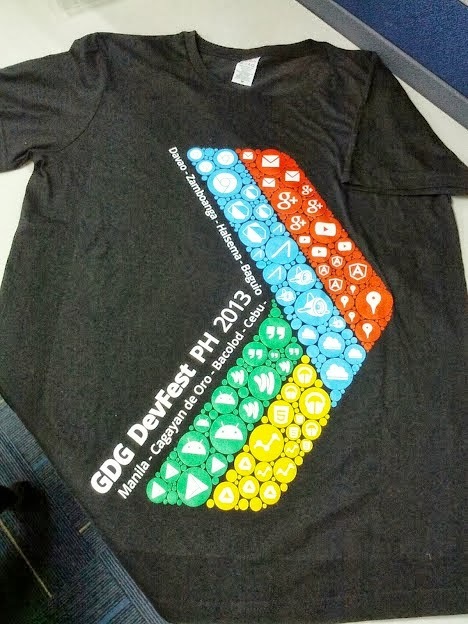 After last year's successful GDG DevFest Philippines and GDG DevFest Women Philippines (DevFestW Philippines), we're organizing GDG DevFest Philippines 2013. The event will be on September 7 so save the date now! We'll be announcing the agenda, list of speakers and the start of registration soon. 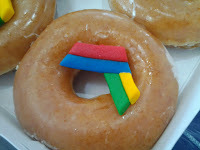 To be updated, add GDG Philippines in your Google+ circles. What is a DevFest? 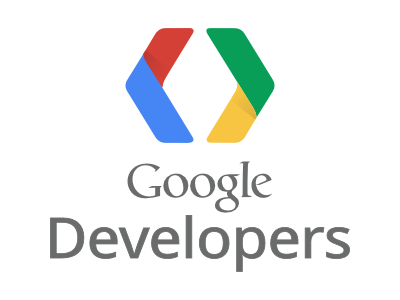 DevFests are community-organized events that provides the opportunity for developers to learn about Google technologies and developer products. Last year's DevFest in the Philippines was held in Manila, Cebu and Bacolod. This year, there will be more so stay tuned and follow the GDG chapter nearest you. Update: Due to various reasons, we are rescheduling DevFest Philippines to a weekday in September. Add GDG Philippines in your Google+ circles to get the updates on the final date. Update 2: GDG DevFest Philippines 2013 will be on September 17 at Alphaland Southgate Tower. We'll be announcing the registration in the next few days. Add GDG Philippines in your Google+ circles for updates. Unable to attend the DevFest last year in Manila, Bacolod or Cebu? Or just learned bout DevFest? GDG DevFest events in the Philippines is coming soon! And this time, there'll be more venues in the Philippines. We'll be posting the signup form, agenda and other details soon! Add GDG Philippines on your Google+ circles for updates. After the successful GDG Devfest Philippines last year, we are organizing a Devfest for women this March 9, the GDG Devfest Women Philippines. For more details about the event, check the website at http://devfestw.gdgph.org/ or visit the Google+ events page at https://plus.google.com/events/cvmcntsklcnc49qjhlrtn4dkj8k.